Update (February, 1st 2019): Modern Fertility’s clinical study has been published in this month's Green Journal, the Official Publication of the American College of Obstetricians and Gynecologists (ACOG)! If you’re like us, and want to know the science behind how we test fertility hormones, this one is a must-read. Click here to read the full study, or continue reading below for a breakdown of the paper. We’re excited to share our clinical study! It provides evidence that the Modern Fertility test and a traditional blood draw can be used interchangeably to measure reproductive hormones in women—yes! In the recap of the study below, we’ll discuss the role that this testing (technically referred to as “minimally invasive testing”) can play in the measurement of hormones to assess fertility as well as women’s health research as a whole. Let’s dig in. We ran a study with 130 women, measuring hormones collected both through a traditional blood draw and by fingerstick. We determined that all eight of the hormones we tested can be measured using either collection method. For all eight of the hormones we tested, levels from a traditional blood draw and a fingerstick were the same. Drumroll please: This study shows that minimally invasive testing methods can be applied to women’s health. How long has this minimally invasive testing been around? The most common method to collect a blood sample for medical testing is through venipuncture—a traditional blood draw (same process as when you give blood). Venipuncture must be performed by a trained phlebotomist (say that five times fast!) and usually requires a patient to travel to a clinic or hospital. If a phlebotomist is able to come to a patient at home, the blood samples must be "spun" in a centrifuge machine then transported back to a lab where they need to be refrigerated or frozen until tested. It’s a lot. Minimally invasive testing, such as the collection of blood on filter paper using a fingerstick, is a simpler alternative. Let’s back up a bit. Finger or heel-stick sampling has been in use since the early 1960s, originally made popular for screening newborns for a condition called phenylketonuria. (You most likely had this screening done when you were born). In this method, a small lancet (a plastic device with a tiny needle, similar to what a diabetic would use to test blood sugar) pricks the tip of the finger (or in the case of newborns, a heel) and blood is dropped onto special filter paper. That paper is then dried and sent to a lab where it is tested. This process is much (much) more accessible than traditional blood draws because you can do it on your own: prick a finger, add blood to filter paper, and mail it back to a lab––boom. This accessibility is particularly helpful when testing women’s reproductive hormones because they usually have to be tested on a specific day of the menstrual cycle. Without minimally invasive testing, a woman has to make an appointment and travel to a clinic––potentially missing work or having to arrange childcare along the way. Since it doesn’t involve time or medical professionals, minimally invasive testing can also be much less expensive. What took so long to bring this testing to women’s health? It’s taken some major advancements in the last decade for technology to get up to snuff to allow fingerstick collection to be widely applied. Now, with the development of advanced filter papers, less painful collection devices, and more robust analysis techniques, fingerstick collection is emerging as a sampling method of choice. In addition to the newborn screening mentioned earlier, this collection is used in studies of aging, drug analyses, nutrition monitoring, screening of diseases like HIV, and more. However, one area in which fingerstick collection is still not widely applied is the realm of women’s health—particularly fertility testing. This is a remarkable oversight. Fertility is fundamentally human––but it can feel like a black box. With simple hormone monitoring, it doesn’t have to be. Before Modern Fertility, the only way a woman could get access to information about her fertility was by getting a consultation at an fertility clinic, followed by a traditional blood draw. As we noted earlier, this can be expensive and inconvenient—which means the vast majority of women may never have this information at their disposal. Access to fertility information is crucially important for family planning and reproductive health. For example, hormone testing can help predict the success of in vitro fertilization (IVF), intrauterine insemination (IUI), and egg freezing, help tailor medication for assisted reproduction procedures, predict and confirm menopause, detect hormonal imbalances that could be affecting fertility, and screen for red flags like Primary Ovarian Insufficiency which can have serious implications for fertility. For context, Primary Ovarian Insufficiency (POI), the early loss of ovarian function, affects 1 in 100 women by age 40, and 1 in 1000 women by age 30. And 1 in 6 couples has trouble getting pregnant or sustaining pregnancy while 7.3 million seek out infertility services in the U.S. alone. Testing reproductive hormones is an integral step in identifying and treating these disorders. Now, with Modern Fertility’s minimally invasive testing option, a woman has an easy way to test reproductive hormones throughout her life. Previous studies have demonstrated that the processes or “assays” for measuring reproductive hormones on filter paper are precise and reliable with a high level of concordance with assays from traditional blood draws. In order to ensure that our fingerstick collection method could be used interchangeably with traditional blood sampling (venipuncture), we ran a clinical study comparing levels of eight hormones in matched venipuncture and fingerstick samples from 130 healthy women, between the ages of 18 and 40 (40 samples is the recommended number for significance––and we wanted to have an even more substantial group). We sampled women on the third day of their menstrual cycles for the following hormones: anti-Müllerian hormone (AMH), estradiol, (E2), follicle stimulating hormone (FSH), luteinizing hormone (LH), prolactin (PRL), testosterone (T), thyroid stimulating hormone (TSH), and free thyroxine (FT4). Since we were testing eight hormones, some of which can be affected by pregnancy or birth control, we did not include women in the study if they were taking hormonal birth control, pregnant, or breastfeeding. We also ran additional analyses that measured the precision and accuracy of the testing method. Let’s get into the logistical details: All of the women in the study were volunteers and provided written, informed consent and the study was approved by an external Institutional Review Board (a group of independent experts). Both venipuncture and fingerstick samples were taken at the same time by a trained phlebotomist. Venipuncture samples were collected, spun and stored at 2-8 Degrees Celsius until analysis. Filter paper blood samples were collected immediately after the venipuncture, using a finger stick by a lancet. Measurement: All samples were analyzed within 48 hours of collection in the same CLIA and CAP accredited lab, on the same equipment (the Beckman Coulter DxI800 instrument), using the same FDA-cleared immunoassays (US Speciality Labs, CAP 8089263, CLIA 05D2130115). Average bias: We also calculated the average bias (or substantial difference) between each pair of matched samples using another statistical method called a “Bland-Altman” procedure. The goals were to 1) make sure that the differences are uniform across the range of the assay and 2) minimize the difference between each pair. We compared our bias calculations with the optimal bias limits established by the European Federation of Clinical Chemistry and Laboratory Medicine (EFLM) guidelines. These are the strictest standards of lab variability. Correlation coefficients: The linear relationship between two variables was also calculated. A correlation coefficient of 1 means the two methods have a perfect association. If you’re into this kind of thing, we calculated Pearson product-moment correlations. Precision: (How repeatable the result is) was calculated by measuring 60 repeats of high and low controls for each assay. The goal is to determine if the repeated measures are close to one another (measured by a coefficient of variation or CV). The lower the CV, the better. Accuracy (as measured by percent recovery) Accuracy/percent recovery was calculated by comparing triplicate measures of five levels of manufacturer-supplied calibrators. Measures of eight reproductive hormones (AMH, E2, FSH, LH, PRL, T, TSH, and FT4) collected by fingerstick and venipuncture passed the tests listed above with flying colors. Each of the Deming Regression equations had a slope that was approximately 1 and a Y-intercept that was approximately 0. You can see a scatterplot of the results for AMH specifically in Figure 1. This means that both sampling methods are highly in agreement for each hormone. That’s a good thing! All of the bias measures were uniform and below the “gold standard” EFLM bias percentages, meaning that measurement differences between the fingerstick and venipuncture were well within clinically acceptable limits. The correlation between venipuncture and fingerstick results was 0.99 for each hormone. Remember, a correlation coefficient of 1 means the two methods have a perfect association...so our results are pretty darn good! A correlation coefficient of 0.9 and above is considered excellent. These results were also statistically significant, meaning there is a really (really) small chance that this strong of an association was by chance. 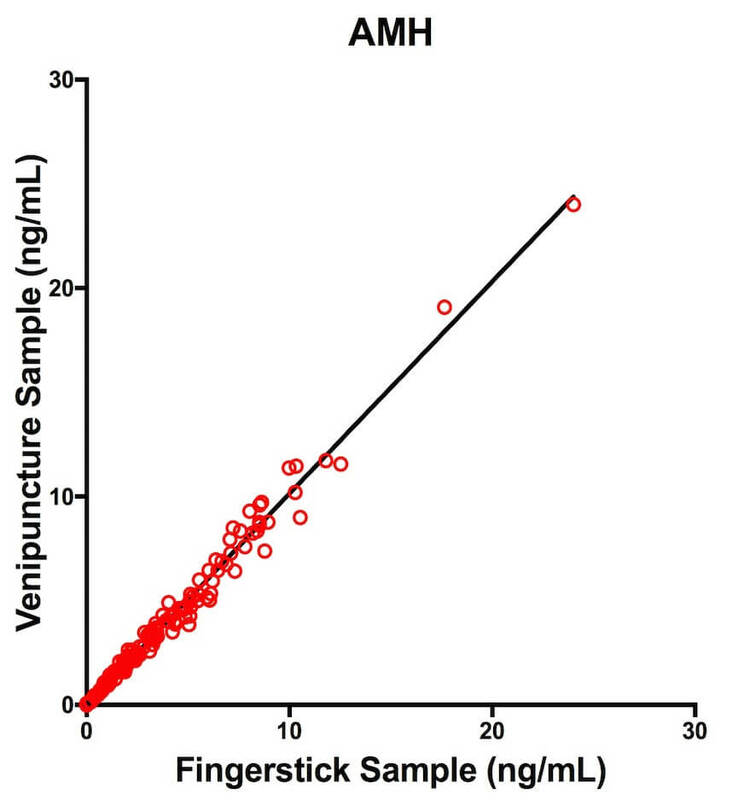 Comparison of AMH concentrations obtained from matched fingerstick and venipuncture samples for n = 130 women and n = 6 contrived samples. The regression line is from the Deming Regression analysis. Precision results: Each assay displayed a high degree of precision with less than 15% CV. Accuracy results: Each assay displayed a high level of accuracy; percent recovery was within the 15% limit of acceptability for biological analyses, as recommended by the FDA. What does this mean? Based on these results, we conclude that fingerstick and venipuncture can be used interchangeably to measure the following hormones in a healthy female population: AMH, E2, FSH, LH, PRL, T, TSH, FT4. Yes! These hormones make up Modern Fertility, an annual test intended for wellness purposes that is ordered and reviewed by physicians. We only use existing technologies—as seen above! Still, we’ve held ourselves to a high standard of clinical validation and have run multiple IRB approved clinical studies––and you just got the lowdown on our latest one. Every Modern Fertility test is run in a CLIA and CAP accredited lab. Fingerstick blood collection will allow more women to test reproductive hormone levels—allowing both women trying to conceive and women planning ahead, to take more ownership over their reproductive options. These hormone tests can also help screen for potential disorders such as polycystic ovarian syndrome or primary ovarian insufficiency. Most importantly, these results can serve as the beginning of a conversation with a doctor—giving women a more active role in their own health and wellbeing. The validation data from this study suggest that there are more opportunities for minimally invasive testing technology in women’s health. These results have the potential to fuel new research into fertility in healthy women. Let’s do this! This is just a snapshot of what we’ve been doing. Stay tuned as we’ve submitted all of our data to a peer-reviewed journal for publication.